The sword was used in battle as the main offensive weapon. 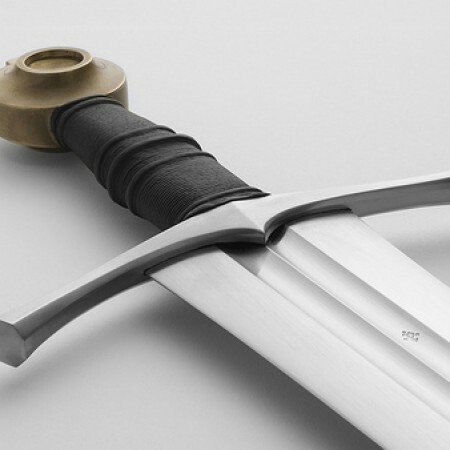 The sword of the Spirit, or Bible, is our main offensive weapon as a Chrsitian. The sword was used in battle to ultimately kill the enemy. Having a sharp edge was critical. It also needed to stay sharp for the entire battle. In the Old Testament, some of David’s mighty men killed hundreds of men in a single battle. If the sword got dull in the middle of one of those battles, the soldier would have need to apply more force to slash, cut or pierce his opponent. For a sword to maintain it’s edge, it needed to be very hard and strong. Tempering and the invention of steel helped immensely with improvements of edged weaponry like the sword. A good sword also needed to be sharp not on just one edge but two. The swordsman also needed to have great skill. Fencing requires great speed. The sword also is used to block. The haft or handle of a sword protects the knuckles. The swordsman also needs to know just The right moment to make the critical jab to destroy and kill his opponent. The swordsman also needed to be very strong. Lots of upper body strength is required to wield what could be a sword that could weigh several pounds. Just think of Goliath’s spear that David won in battle. Just the head of it weighed 600 shekels or about 15 pounds. You start swinging that for a few hours like some of those guys in the Old Testament and see if you don’t get tired. The sword of the Spirit or the Word of God is quick and it is powerful like a good swordsman. It is also sharp like a good, tempered steel sword on both sides. But it is not meant to do physical battles like a physical sword. It is meant to do spiritual battles. The spiritual battle is a battle between the spirit, soul and body. The Word of God is used to cut the flesh away from the soul and spirit. It is also used to cut and separate the thoughts and intents of the heart. It shows us who we really are. It reveals sin in our lives as it cuts with its sharp edge. The sword of the Spirit is important for our Christian growth each and every day. The Word of God reveals sin in our lives. It showed us our need of a Saviour when we first came to Christ. It provides conviction as the preacher opens the Bible and drops the plow. It cuts, but it cuts skillfully like the surgeon. The balm of Gilead is then applied and the wound heals cleanly under the skill of the great physician. The Word of God tells what we are often afraid to admit to ourselves. It shows us the real intent of our heart and the evil and sin that dwells there. Thank God for sword of the Spirit. This post has been seen 2252 times.